My oldest son loves his technology, especially computer technology. "Computer time" is the ultimate gift, and revoking it the ultimate punishment. This morning, Mommy’s IT Department received a service ticket relating to the new Mac OS X Lion. With the advent of Lion, my oldest learned something that often fazes adults: technology changes, even when you don’t want it to. He’s having a little trouble adjusting to the change in scrolling direction. To move a page up, you scroll your finger down. On the old OS, scrolling down moved a page down. He’s only 6, but technology rules his life and he learns quickly how to keep up. Honestly, our kids don’t do much without tech. Their toothbrushes have timers, color-changing LED lights and they vibrate. The boys only have to apply the paste. It’s like something out of The Jetsons. It’s really important for us to set limits on technology usage, even though we are in no way opposed to using technology. We tried setting timers and alarms but with three boys running around the place, we just couldnt keep track. 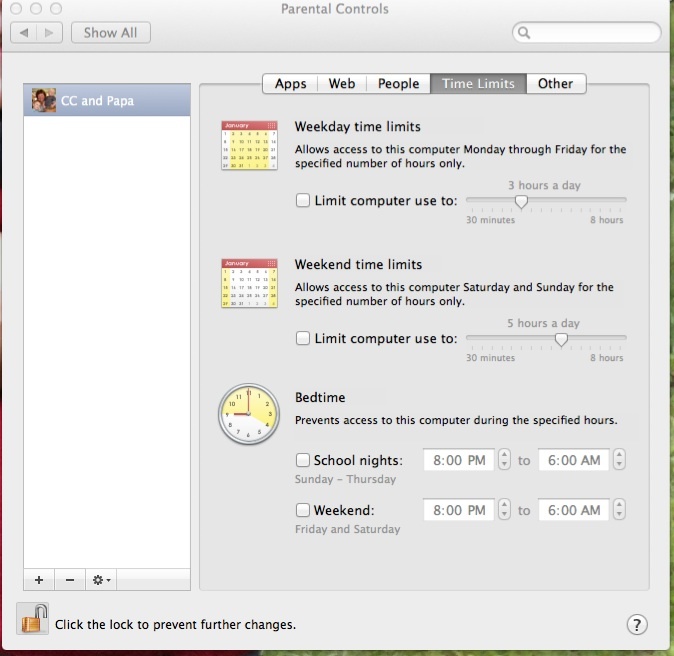 So, we utilized the parental controls on our Mac to allocate each child 1 hour of use, daily. The kids can’t log in before 7am and they can’t log in after 7pm. And since we've implemented this system, our "get off the computer" shouting time is gone. We don't really think of it as caging him in, rather, we're keeping unsavory virtual elements out. To set the same limits for your kids on a Mac, click on the Apple icon in the top left corner of the screen, then select System Preferences. 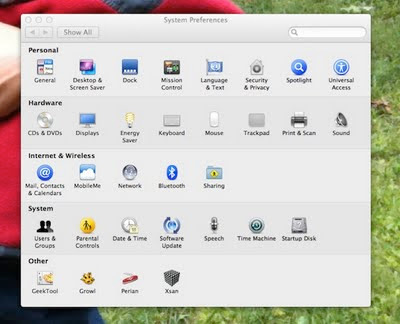 Under System (4th row down), look for the cautionary-yellow colored “Parental Controls” app. The System Preferences screen. What the heck is Xsan? Only an administrator, preferably parents, should know the system password required to set or change any controls. Through this app, you can limit your children's access to certain websites, limit their allowed contacts, or limit the time they are allowed on the computer. If only I could set these kind of limits on my husband's computer use. To set parental controls on your PC, visit this Windows Help page. There's lots of interesting data on how much kids and teens are using computers and technology here. The average eight year old spends over seven hours a day using entertainment media. With our hour-max rule, we're practically Amish. I am sure someday he will find away around these constraints and break out of the technology cage we have built. But when he does, I think my husband and I will secretly feel proud of his accomplishment. 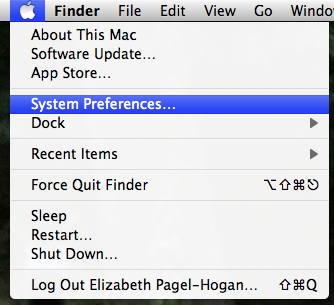 If my son has had an exceptionally great day, and he asks for extended time, with a magical dance of my fingers across the keyboard, I perform a little computer hocus pocus (enter my administrator password) and grant his wish. But I have to type very quickly because he likes to try and memorize my keystrokes. My husband noticed that and announced proudly, "That's the first step in becoming a hacker." I can hear the cage rattling already. I have a worn out pet peeve about the use of the term "hacker." Hackers, in old time speak, are just people who are good at writing code. The evolution of this term to mean exclusively people who steal passwords has always bugged me. Stealing passwords should be discouraged as strongly as too much screen time.